Last year was Unibroue's 25th anniversary, so for the big milestone, the brewery came out with two beers. First off, they came out with 25e Anniversaire, a dark black forest cake ale. They also reviewed a beer called Blonde de l'enfer. Blonde de l'enfer was only available in the US until they released it as part of this winter's Unibroue collection (which also features Don de Dieu, Blonde de Chambly, La Fin du Monde, Maudite and Trois Pistoles). 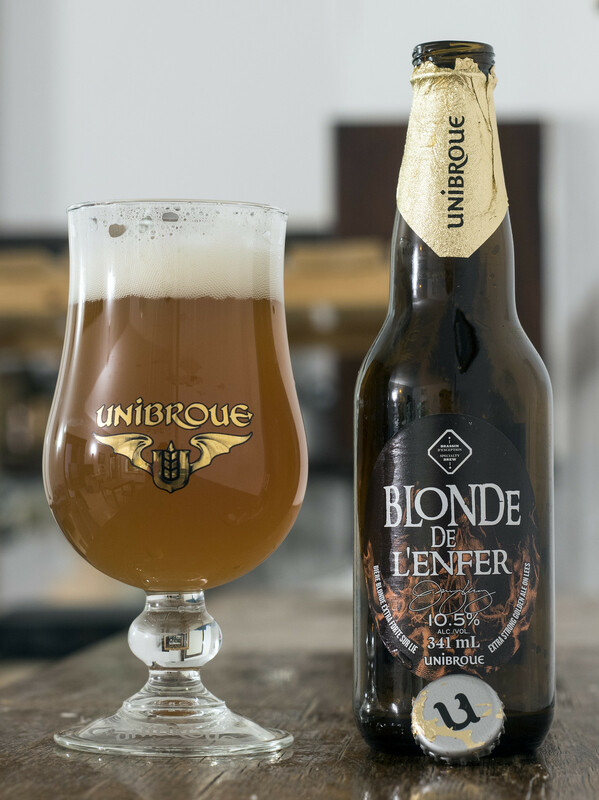 Blonde de l'enfer is Unibroue's take on a classic Belgian Golden Strong Ale. Appearance: Pours a light copper brown body with a lot of carbonation. Thick off-white head that barely moves, but once it does it leaves behind a sprinkling of lacing that looks a bit like a spider's web. Aroma: Notes of bubble gum, a hint of iron, a good amount of sweetness, quite boozy at first but it diminishes fairly quickly, and a very subtle hint of pepper/coriander spice at the very end. Smells like a lot of Unibroue's golden ales so far. Taste: The first thing I get from this beer is the flashback of beers of yesteryear - this tastes like a medley of Unibroue's one-offs I've had over the years.. it reminded me of Eau Bénite, 1837 and even Lune de Miel. This Belgian Golden Strong Ale is decently sweet with a bit of a candi sugar/honey-like flavour to it, a hint of iron-y notes to it, the typical Unibroue yeastiness that gives it a certain je ne sais quoi to it. At 10.5%, I don't get any noticeable booziness to it but I'm definitely feeling my body warm up a bit from this beer. There's a light amount of banana and a hint of coriander/pepper at the end again. Very easy to drink, nice and sweet yet the booziness sneaks up on you. Overall Thoughts: Solid offering by Unibroue but this reminds me too much of many of their past offerings. Unibroue's already brewed a Belgian Golden Strong Ale before, Eau Bénite (according to BJCP) and many of Unibroue's one offs are considered to be the same style according to Untappd. This is something I'd like to see become permanent, but unfortunately will be gone once the spring collection packs roll out in April or so. Surprisingly easy to drink at 10.5% but the booze really does sneak up on you, so watch out! I hope one of these days Unibroue comes out with a collection of just one off beers.. that'd be the day!